We are thrilled to announce the appointment of Dinis Sousa as the first ever Assistant Conductor of the three Monteverdi ensembles. Sousa’s appointment represents a significant landmark for the ensembles, which have been solely directed by John Eliot Gardiner since he founded the Monteverdi Choir 54 years ago. This new role was created to give a young conductor the opportunity to work alongside John Eliot Gardiner and to be involved in the process of musicological research, preparation, and rehearsing associated with all MCO projects and tours. The new Assistant Conductor will play a major part in upcoming projects with MCO, such as the current Berlioz Series tour of Europe and the US, the Verdi Requiem tour later this autumn, and next year’s Handel and Berlioz projects, alongside leading new education and outreach initiatives. 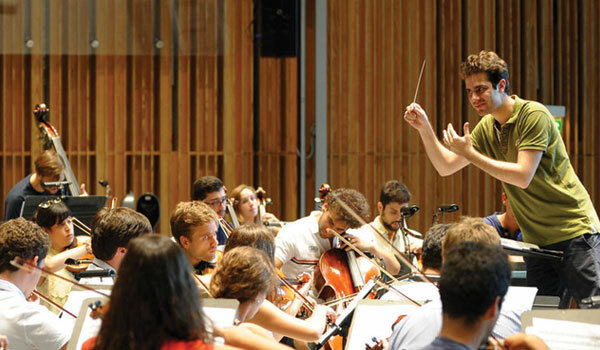 The Portuguese conductor first met John Eliot Gardiner in 2012 while studying at the Guildhall School of Music and Drama, and subsequently attended rehearsals at which he closely watched Gardiner and his ensembles at work. In the two years leading up to his appointment, Sousa had the opportunity to assist on large-scale projects with the Monteverdi Choir, the English Baroque Soloists and the Orchestre Révolutionnaire et Romantique, both in London and on tour. This saw him conduct members of the Choir in a critically acclaimed performance of Berlioz’s Roméo et Juliette at the 2016 BBC Proms, and take charge of several rehearsals in this year’s Bach Cantata Ring tour.